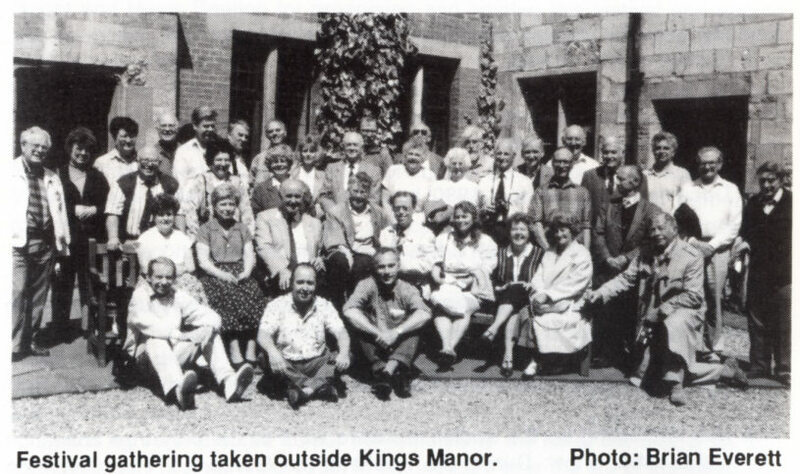 The 18th 9.5 International Festival, hosted by UK club Group 9.5, was held from Thursday 20th to Sunday 23rd May 1993, at the Ellliott Hotel, Sycamore Place, Botham, York, Yorkshire, UK, organised by UK Group 9.5 Vice President, the late Roger Spence, ably assisted by his wife Mavis. Over fifty people attended , twelve were from France, with five from the Nederlands, two from Germany and the balance from the UK.. Normally dinner and aperitifs were taken at the Hotel Elliot where the guests were accomodated. All the 9.5mm competition films were ably projected in a lecture room in Kings Manor, a fine historic medieval building, by then, part of York University. During the Festival, a number of visits were arranged. On the Saturday the group visited the Museum Of Mechanical Music at Rufforth and were joined by members of the Wakefield and Grimsby Amateur Cine Clubs for lunch. Eighty people enjoyed a concert on both mechanical fairground and dance hall organs. Then Terry Ladlow played the Compton organ with a 'Round the World' medley and a specially composed '9.5 Rules' march. The Trembloys from the French Club danced whilst opthers sang. An afternoon of merriment. A lovely sunny Sunday morning saw the group leave York as the Minster bells were ringing, off on to Haworth for a ride on a vintage steam train. After a short break in the cobbled streets of the old town, back to York following the river Wade as it wends its way through the pastoral valley. The 9.5mm film competition was held in the Kings Manor lecture room, part of York University. 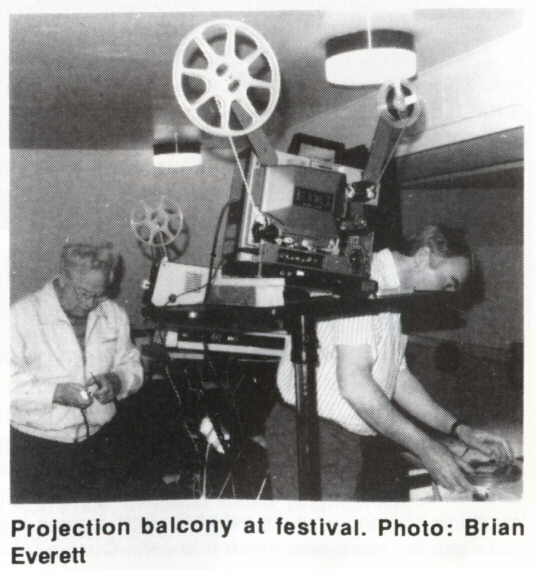 The projectors used were a French SEF Elf, a French Ligonie OSM 9 and a French Ligonie IM 250 (all 16mm / Super 8mm machines converted to 9.5mm in France). As there were thirty 9.5mm films entered, the competition films were divided into three sections. There was a four minute competition with nine entries. The main competition was split into two categorys Documentary and General Fiction. There were also prizes for a special theme - 'Temptation'. Three judges were appointed from the Nederlands, France and the UK. It was interesting that the audience award went to the only true animation film in the entire show. The four minute competition had nine entries, covering such diverse subjects as an excellent cartoon of the Paris club, two steam train railway shorts, a visit to a Kent village in the early 50s and a film on the Cotswold village of Bourton-on-the-Water, Eton College and the Seal Knots, a County show and Art in Brief. Among the many films in the General Section was one from Paul Bigou "Furtive Recontre" which, filmed on Fuji Velvia, was of a professional standard, being an imagined meeting between Toulouse Lautrec and Mozart. Competition in the Documentary Section was particularly strong. There were two very good films from Robert Latrasse of the Paris Club. One "Grand Canyon" was a photographic interpretation of the Grand Canyon Suite, filmed on Kodachrome 11 in the Vosges, in southern France. His other film "A Nest In the Town" was of a bird's nest on a building site, threatened by demolition and two domestic cats. Other documentary films covered wing board sailing, Paris, events in Bognor Regis, a school for asmatic children on the Isle Of Wight from Ken Wordsworth and a film on Chicago fom Brian Everett. The winners were announced at the dinner on the Saturday night. Tony Jackman gave his usual toast to Charles Pathé in three languages, French, German and our own. A very enjoyable event. We can now look forward to next year's International in France, to be held at Vaux-Sur-Mar, which is between La Baule and Royan. It is to begin on Ascencion Day around May 1994.